This isn’t your kid’s Halloween cookbook. 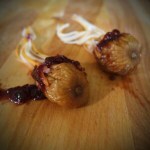 The 69 gory recipes in Dead Delicious all look like human body parts. 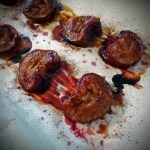 It’s my love letter to all the grown up goths, Hannibal fans, and horror lovers who like to play with their food. Already covet a copy? Click here! It’ll arrive on your doorstep in only two days with Amazon Prime. 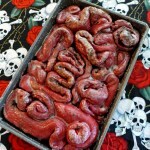 In addition to the preview recipes you’ve seen for brains, guts, eyes, and ears, Dead Delicious includes half a dozen skinned torso spreads for elegantly gory meals. And yes – the skin in the torso above is a surprisingly easy bread recipe designed to soak up all the lamb ribs and tomato heart juices before you rip it apart. You don’t need to be a zombie to enjoy the illusion you’re feasting on human flesh! The 69 Gore-Met recipes in Dead Delicious will cover your table with so many eyes, ears, guts, and brains your kitchen will look like a serial killer’s crime scene. Whether you’re into slasher flicks, shambling zombies, vampire drama, or good old fashioned mad science, you can safely sate your bloodlust with everything from edible strings of human ears to looping guts meant to be pulled apart at the table to half a dozen entire torsos you wouldn’t be ashamed to serve Hannibal Lector. Best of all, you can terrify everyone at your table with dozens of recipes tailored to Paleo, Gluten-Free, Vegetarian, and Vegan diets. Let your friends know that this year, everyone is one the menu! We tried your mushroom capped Rotted Eyeballs today it they were delicious!! !